If you're going to win in modern warfare, you have to use every weapon in your arsenal. Guns, tanks, and bombs are great, but if that's all you put into play, you're going to lose. Information and propaganda have been a major part of war efforts for more than a century, and failing behind in those areas will doom you. Amazonia has gone to war with Aztlan, which is supported by the greatest public relations machine the world has ever seen. Ready to fight fire with fire, Amazonia has brought in Horizon to sway public opinion, and possibly the tide of the war, to their side. To make their case, they'll need stealthy runs, fast moves, and quick thinking. And they'll need it fast, because Aztlan is pressing hard and not inclined to show any mercy. Colombian Subterfuge is a complete adventure that brings shadowrunners into the war raging in Bogota while enlisting them in Horizon's propaganda efforts. It contains all the information gamemasters need, from plot details to NPC statistics, to plunge players into the chaos of war. 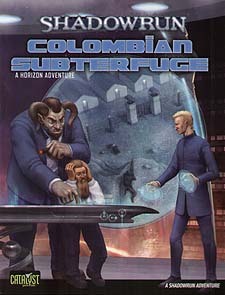 Colombian Subterfuge is the third in the series of Horizon adventures and is for use with Shadowrun, Twentieth Anniversary Edition.